Sundays, before life got even more hectic than usual, used to be a day of fix breakfast for my wife and let her spend a few hours in front of the “tely”, that’s U.K. English for television, watching Coronation Street which for those not in the know is an English television series that has been on the air forever and appears to be not going anywhere soon. It was on this show that I first came across this recipe and I was thoroughly enthralled so much so that I went in search of the ultimate version. After searching the Internet and various cook books and talking to relatives in the U.K. I was soon to discover that in fact there IS NO definitive recipe. In fact the only thing the various and sundry recipes had in common was Lamb and Potatoes and even then the debate raged on about “which cut of lamb to use”, neck-leg-kidney, or “what potatoes were the best”, white or Yukon gold, or even whether or not to use Lamb stock or Chicken stock. Now I rarely make this recipe because I am supposed to avoid red meat (I have Hemochromatosis which is a fancy Doctor term for excess Iron stored in my liver) so to me it does not make much difference which part of the Lamb to use with the exception of the Kidney—- I’m not a big fan of Kidney— nor does it matter which potato although I am partial to Yukon Gold . All that matters to me is that the dish comes out flavorful and satisfying. 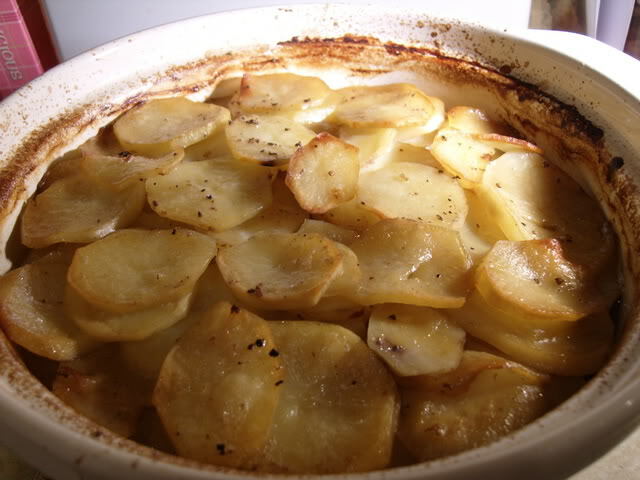 So I now present to you my take on Lancashire Hot Pot which by the way is the one my late Father-In-Law just loved and being that he was from Manchester England I take it as a very big compliment. Dish it out, tuck in, and be in heaven…………. That photo makes me drool instantly. I love potatoes, so much. I used to watch Coronation Street on the Tely….and many other British sitcoms/shows like “one foot in the grave” and “Casualty” and “keeping up appearances” Thanks for making me reminisce…. Used to love watching Corrie as well but have not seen it in forever. Guess I’ll just have to make a day of it and top it off with some hot pot. Now this looks like a good cold weather food. Yum.